The security Officer of Kiryat Arba, where the terrorist attack resulting in the murder of Hallel-Yaffa Ariel,13, occurred this morning (Thursday), described the sequence of events during the attack. "At 8:38 this morning we received an alert indicating a terrorist penetrating the town perimeter fence, the security squad assembled, and we immediately began advancing toward the house," said Eyal Gelman. He explained the advance had to be gradual as the security forces need to make sure that the house was completely surrounded. Gelman himself stood back some distance so that he could command the operation and prevent any terrorist or terrorists from escaping towards the other houses in the area. 3 security squad personnel, including Ariel's father, Amichai, then entered the house, and began searching the house. Upon entering Hallel's room, they encountered the terrorist, who was lying in wait to ambush them. The terrorist stabbed one of the security personnel, Shuki Gilboa, wounding him. The rest of the squad then arrived and shot the terrorist dead. 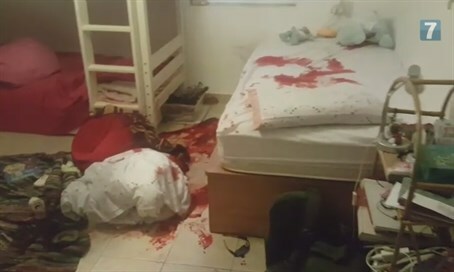 "At this point I entered the room", continued Gelman, "and I saw Hallel lying on the bed, having been stabbed over 8 times, and Shuki bleeding on the floor. We started CPR on Hallel and stopped Shuki's bleeding. Medical personnel arrived very quickly and evacuated them." The Security Officer praised the performance of the security forces, saying "everything worked, all systems were operational, and still we paid this heavy price. It could have been much worse had the terrorist continued to the other houses, and we prevented that, but still, as far as we're concerned, this is a price to heavy to bear."